Order A. Vogel (Bioforce) Digestisan 15ml from the Online Health Food Store UK. 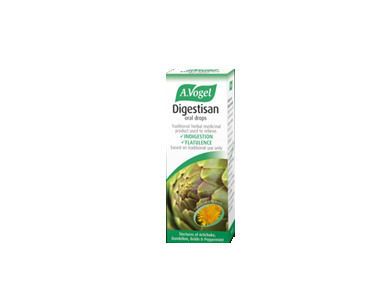 Buy A. Vogel Digestisan® - herbal remedy for the relief of indigestion and other quality Digestive Aids safely online in the UK. Digestisan® is a licensed herbal remedy for the relief of indigestion, feelings of fullness and flatulence. A. Vogel's Digestisan is produced using extracts of freshly harvested, organically grown cynara, dandelion, peppermint and boldo. The herbs are picked fresh and used within 24 hours of harvest. A traditional herbal medicinal product used to relieve indigestion, feelings of fullness and flatulence associated with over-indulgence in food or drink or both, exclusively based upon long-standing use as a traditional remedy. Our UK Health Shop sells real A. Vogel (Bioforce) and other Digestive Aids from top-quality brands safely online to customers throughout the United Kingdom in England, Wales, Scotland and Northern-Ireland. View more products on the Online Health Food Store from A. Vogel (Bioforce). Where to buy A. Vogel (Bioforce) Digestisan 15ml safely online? Shop at the Online Health Food Store if you are wondering where you can buy A. Vogel Digestisan® - herbal remedy for the relief of indigestion safely online in the United Kingdom. Our Health Shop is located in the UK and our award-winning independent has been serving customers in England, Wales, Scotland and Northern-Ireland since 1976. You can buy our Digestive Aids online and we post out orders to any UK address. Digestisan 15ml - A. Vogel Digestisan® - herbal remedy for the relief of indigestion in Digestive Aids and Herbal Remedies, Tinctures & Supplements.